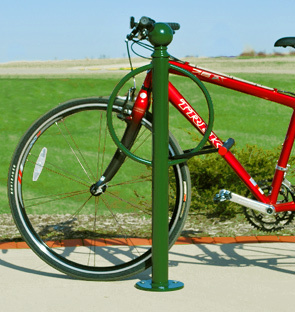 The Classic bollard bike rack is the ideal dual-purpose bike rack. It can be used to limit access to bike-only trails and parking areas while also providing riders with secure parking in both urban and rural environments. They can even be used as security and/or traffic barriers to help protect pedestrian walkways. This 2-3/8" O.D. tubing bike rack is available in galvanized, powder-coated, and electro polished stainless steel. 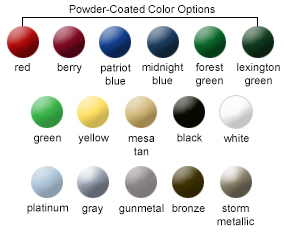 Choose in-ground or surface mount with base plate. 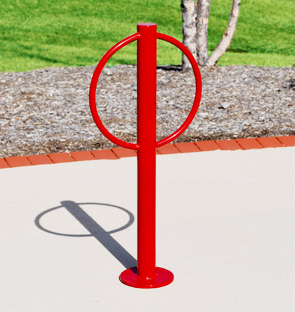 The bollard bike rack features round 3/4" rod arms that can secure up to 2 bikes, and is easy to use regardless of the type of bike being parked. Drop In Anchors available for concrete installation.